The national spokeswoman for the National Rifle Association on Friday doubled down on her claim that members of the media “love” mass shootings, like last week’s school massacre in Parkland, Fla., because of the bump in television ratings that some networks experience in their wake. 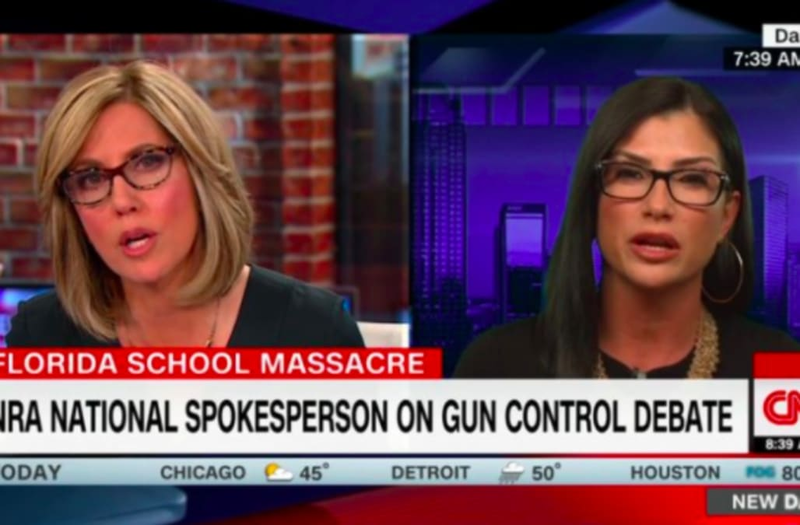 In a heated exchange with CNN’s Alisyn Camerota on Friday morning, NRA representative Dana Loesch was asked by the “New Day” host why she would make such an inflammatory assertion. In fact, the gun industry, which is closely allied with the NRA, is the one that profits from mass shootings; gun sales surged after the 2012 Sandy Hook Elementary School massacre in Newtown, Conn., leading to a jump in accidental shooting deaths. “We’ve never said that, Dana. We’ve never said that,” Camerota countered. In a speech at the Conservative Political Action Conference in Maryland on Thursday, Loesch accused news networks of chasing ratings in the aftermath of mass killings like the one at Marjory Stoneman Douglas High School. Camerota asked why Loesch would resort to using such “inflammatory rhetoric” at CPAC. Loesch, who appeared at a CNN-hosted town hall with Parkland, Fla., survivors earlier in the week, also accused the media and lawmakers at CPAC of unfairly targeting the NRA. “We will not be gaslighted into thinking that we’re responsible for a tragedy that we had nothing to do with,” Loesch said. She reiterated that stance on Friday while discussing solutions to curb gun violence. “No, we absolutely do not,” Loesch said. On Thursday, President Trump predicted the NRA would back such changes. But when asked Friday if the NRA would back the new age requirement, Loesch said it would not. “Raising the age is not going to solve psychosis,” she said. Loesch said that when she was 20 years old, she lived alone and owned guns — a shotgun and an AR-15 — for her personal protection. “I don’t want anyone not to have the ability to defend themselves,” she said.